Bellvitge Biomedical Research Institute (IDIBELL) is a biomedical research centre focused on improving health care. To achieve this goal, both clinical and basic research are carried out. 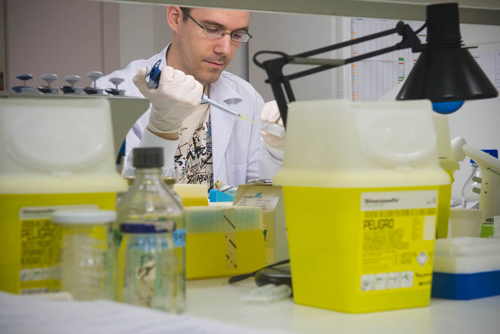 The more than 800 researchers that work at IDIBELL represent the main asset of the institution. IDIBELL has its own researchers and integrates research carried out by scientists at the University Hospital of Bellvitge, Viladecans Hospital (both from the Catalan Institute of Health), the Catalan Institute of Oncology and the University of Barcelona in Bellvitge Campus . Since 2015*, scientists at IDIBELL are organized into three broad subject areas, nine research programs and a total of 63 groups, each of which investigates various aspects of biomedicine, mainly cancer, neurosciences and other prevalent diseases through the area of ​​translational medicine. In addition to the talent and ability of its professionals, IDIBELL has first class technology to conduct high-quality research. The Institute has an office for transfer of research results, recognized by the Spanish Ministry of Science and Innovation. The office is responsible for managing the research projects of researchers and facilitates the translation of research results to clinical practice. (*) The current website shows the distribution of groups prior to 2015, when the classification was done in six different areas. We are working to update the information as soon as possible. Excuse us for any inconvenience.